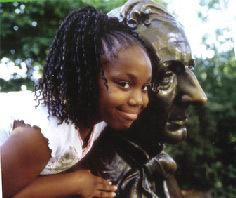 The Hans Christian Andersen Storytelling Center has sponsored storytelling for more than 60 summers at the Hans Christian Andersen statue near Conservatory Pond in New York City's Central Park. It also has a long history of co-sponsoring story telling training in the New York City public school system and presenting programs at the Hans Christian Andersen School in Harlem (P.S. 144) or other public schools and at Scandinavia House. With the help of funding provided by Travelers and others, we have provided storytelling training at PS64, PS333, and PS242, descriptions of these outreach programs as conducted the last couple of years are provided in the linked reports (1), (2). In 2015/2016, 2016/2017 and 2017/2018, the Hans Christian Storytelling Center will sponsor story telling training by professional story tellers for children at a public school in New York City. The children will have an opportunity to present stories in a story telling competition and the winners will be included in the story telling program and be featured as story tellers at the Hans Christian Andersen statue or at Scandinavia House. One of our storytellers also works with children at PS 333, and these youth storytellers are featured on a regular basis in our program in Central Park. In the spring of 2011 the Hans Christian Storytelling Center sponsored story telling training by professional story tellers for children at public schools P.S. 144 and P.S. 333. During the summer story telling season some of the talented young story tellers were included in the story telling program and were featured as story tellers at the Hans Christian Andersen statue. The Hans Christian Andersen Storytelling Center, Inc., the Department of Youth and Community Development (DYCD), through its after school Beacon programs, and the Unity Project entered into a collaboration to celebrate Hans Christian Andersen and to promote resilient life skills in children and youth through a story telling and art initiative based on the works of Hans Christian Andersen. The Unity Project was one of the founding collaborators in the Healing Arts Project working with DYCD. Its purpose was to promote resilient strengths in youth that help them to transform crises into opportunities for personal and community development and to foster the development of a generation of competent global citizens. There were 80 Beacon programs, administered by DYCD, located in public school buildings throughout NYC. Adherence to youth development principles and a high level of quality community involvement are hallmarks of the Beacon model which continues to set the standard for other municipalities to follow. They operate a minimum of six days and 42 hours a week, in the afternoons, evenings, weekends, during school holidays and vacation periods and during the summer. In addition, there are programs for adults. DYCD's Beacon programs are committed to ensuring the safety, engagement and empowerment of all its youth and adult participants. Andersen's 200th birthday was commemorated in 2005. The life of Hans Christian Andersen is itself a touching story of resilience as he overcame a number of personal adversities and directed his life's work to the upliftment of others. For the first part of this program, his story was read by volunteer storytellers to youth at Beacon programs throughout the city. The resilient qualities of his life were used as a "lens" through which children looked for these same strengths in the characters in his stories. Then, stories from Hans Christian Andersen's anthology of work were read to the children and youth. Beacon staff was provided with a training program that helped them see how to bring out these resilient strengths contained in the stories and in the lives of their youth participants. Then, assistance was provided to help the staff work with the youth to translate these insights into their own artistic expressions. The Hans Christian Andersen Storytelling Center sponsored awards to acknowledge the illustrations of the life lessons contained in these stories at Hans Christian Andersen's 200th birthday party at Scandinavia House on April 2, 2005.